From Carnegie Hall to the MCO, Asier Polo bowls audiences over. 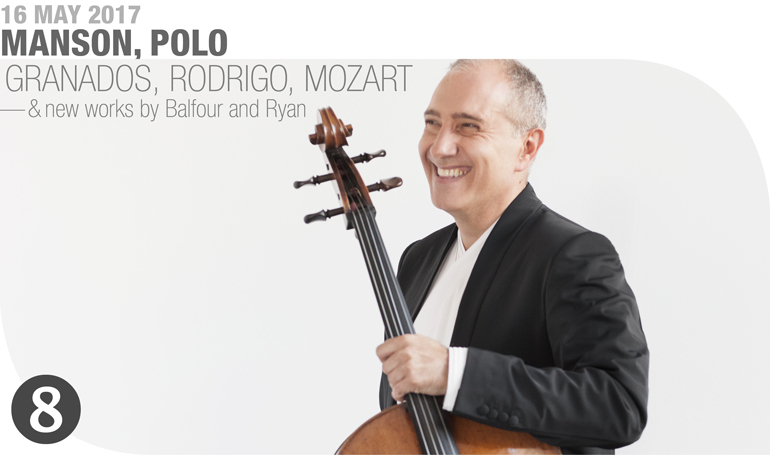 In Spain, he is considered the leading national cellist; in Winnipeg he is, alongside Colin Carr, a bonafide cello celebrity. A champion of modern Spanish music, Asier Polo will play Joaquin Rodrigo’s whimsical Concierto in modo galante and Granados’s rapturous Intermezzo de Goyescas. The 20th-century music of the Spanish-speaking world is known for its neo-romantic tendencies, and this is especially true of these two pieces, which are rich with Spanish folk flavours. Mozart’s charming but brief Symphony No. 27, on the other hand, helped set the stage for the romanticism that would flourish in the following decades. Composed in the galant style popular at the time, the Symphony bristles with humour, song-like melodies, and dance rhythms. This concert will also feature a new work for strings by Canadian composer Jeffrey Ryan, recipient of New Classical Music Award for career achievement. Asier has performed with some of Europe’s most prestigious orchestras, including the National Orchestra of Bordeaux, the Basel Philharmonic, and the Monterey Symphony Orchestra. Testifying to his eminent standing in Spain, he’s also toured South America with the Spanish National Orchestra. The concerts begin at 7:30 pm on May 16th in Westminster United Church , 745 Westminster at Maryland. Tickets are $34 for adults, $32 for seniors and $10 for students, including GST, at McNally Robinson , the West End Cultural Centre (586 Ellice at Sherbrook), Organic Planet (877 Westminster Ave) or MCO’s Ticketline (204-783-7377). Asier Polo is considered by the music press to be one of the most important Spanish cellists of his generation. He has worked with many major international orchestras such as the Philharmonia Orchestra, the Orchestra Sinfonica Nazionalle della RAI, Dresdner Philharmonie, Orchestre de Paris, BBC Philharmonic, Bergen Filharmoniske Orkester, Israel Philharmonic Orchestra, Berliner Symphoniker, Orquesta Nacional de México, Orquesta Sinfónica de São Paulo, Louisiana Philharmonic, Orquesta Nacional de España and the Basel Symphony Orchestra, and under the baton of distinguished conductors such as Pinchas Steinberg, Christian Badea, Rafael Frühbeck de Burgos, Claus Peter Flor, Carlos Miguel Prieto, Günther Herbig, Juanjo Mena, Antoni Wit and Anne Manson. He is a regular guest at important festivals such as those held in Schleswig-Holstein, Nantes, Ohrid, Biennale di Venezia, Rome, Lisbon, Morelia, Granada and the Quincena Musical in San Sebastián. Asier Polo has appeared with great artists such as Silvia Marcovici, Nicolás Chumachenco, Sol Ga­betta, Isabelle van Keulen, Josep Colom, Eldar Nebolsin, Gerard Caussé, Cuarteto Janáček, Cuarte­to Casals and Alfredo Kraus—who, in his last years, invited him to perform as soloist at his concerts, with engagements at the Maggio Fiorentino, Covent Garden in London, the Tonhalle in Zurich and the highly esteemed Musikverein in Vienna, as well as in a tour of the major concerts halls in Japan. Praised for his “strong personal voice” ( Globe and Mail ), “masterful command of instrumental colour” ( Georgia Straight ), and “superb attention to rhythm” ( Audio Ideas Guide ), Jeffrey Ryan writes music that runs the gamut from opera, art song, and choral music to chamber and orchestral works. Recipient of SOCAN’s 2014 Jan V. Matejcek New Classical Music Award for career achievement, Ryan’s music has engaged audiences in concerts and broadcasts worldwide. His many commissions include works for the Cleveland Orchestra, Vancouver Symphony, Toronto Symphony, Montreal Symphony, Victoria Symphony, Manitoba Chamber Orchestra, Tokyo String Quartet, Arditti Quartet, Tafelmusik Chamber Choir, and Tapestry Opera. Major recent projects include Seasons of the Sea with First Nations storyteller Rosemary Georgeson for Vetta Chamber Music; Midnight Sun Songs for the Northern Arts and Cultural Centre (Yellowknife); and Book of Love for Kokoro Dance and Standing Wave. Recordings of Ryan’s music have garnered four JUNO nominations and five more from the Western Canadian Music Awards. His portrait CD Fugitive Colours , performed by the Vancouver Symphony with the Gryphon Trio, launched the Naxos Canadian Classics series and won the 2012 Western Canadian Music Award for Classical Recording of the Year. Ryan’s growing discography includes recordings by musica intima, the Canadian Chamber Choir, clarinetist Cris Inguanti, pianists Rachel Kiyo Iwaasa and Yoko Hirota, the Thunder Bay Symphony, the Penderecki String Quartet, and Standing Wave. Based in Vancouver, Ryan is Composer Advisor for Music Toronto, and was the Vancouver Symphony’s Composer Laureate for 2008/09, after serving as the VSO’s Composer-in-Residence from 2002 to 2007. He was an Affiliate Composer with the Toronto Symphony from 2000 to 2002. He holds degrees from The Cleveland Institute of Music (where he studied with the distinguished composer Donald Erb), Wilfrid Laurier University, and the University of Toronto. Of Cree descent, Andrew Balfour has written more than 30 choral, instrumental and orchestral works, including Take the Indian , Empire Étrange: The Death of Louis Riel , Migiis: A Whiteshell Soundscape , Bawajigaywin , Gregorio’s Nightmare , Wa Wa Tey Wak (Northern Lights), Fantasia on a Poem by Rumi , Missa Brevis and Medieval Inuit . He has been commissioned by the Winnipeg, Regina and Toronto Symphony Orchestras, Ensemble Caprice, the Winnipeg Singers, the Kingston Chamber Choir and Camerata Nova, among others. His works have been performed and/or broadcast locally, nationally and internationally. Andrew is also the founder and Artistic Director of the innovative, Winnipeg-based Camerata Nova. Founded in 1996, this 14-member vocal group presents an annual concert series as well as special performances. With Camerata Nova, Andrew specializes in creating “concept concerts” that explore a theme through an eclectic array of music, including new works, arrangements and inter-genre and interdisciplinary collaborations. Andrew is passionate about music education and outreach, particularly in schools located in low-income areas of Winnipeg and northern communities. Since 2008 he has worked on behalf of organizations such as the National Arts Centre, Camerata Nova, the Winnipeg Symphony Orchestra and various Manitoba school divisions, offering young students empowering sessions in the joy and freedom of self-expression through music. Andrew was Curator and Composer-in-Residence of the WSO’s Indigenous Festivals in 2009 and 2010, and in 2007 received the Mayor of Winnipeg’s Making a Mark Award, sponsored by the Winnipeg Arts Council to recognize the most promising mid-career artist in the city. Kiwetin-acahkos (pronounced ‘Key way tin a sah quos’) is an orchestral work that celebrates our northern country—its people, diversity, and the landscape that so defines our environment. Its title comes from a Cree word that means ‘North Star,’ and evokes many other meanings. Kiwetin-acahkos was commissioned by the Toronto Symphony Orchestra at the recommendation of the MCO, and funded by the Government of Canada in recognition of Canada’s 150th anniversary. This performance is the piece’s world premiere. The Toronto Symphony Orchestra will perform it again in June 2017. The music of Granados is strongly coloured by the folk traditions of his native Spain. His piano works and songs brim over with alluring Spanish-style rhythms and melodies. Like his contemporary, Dvořák, he rarely quoted authentic folk tunes, preferring to compose original themes in folk style. In 1911, he composed his most famous piano piece, the suite called Goyescas . It was inspired by the vivid paintings in which the celebrated Spanish artist, Francisco Goya (1746-1818), had depicted the society and landscapes of his homeland. American pianist Ernest Schelling, the first person to perform Goyescas in America, suggested that Granados use it as the basis for an opera. The unusual creative sequence was as follows: Granados and author Fernando Periquet created the dramatic form, Granados composed the music (founded upon, and expanded from, the piano suite), and Periquet fitted a final libretto to it. The one-act opera runs approximately one hour. The plot is a typical operatic story of love, jealousy and revenge involving a group of young Spaniards. The Paris Opéra intended to stage the premiere production, but the outbreak of the First World War made that impossible. Ernest Schelling arranged for the debut to take place at the Metropolitan Opera in New York. Granados travelled from Spain to supervise the rehearsals. The highly successful premiere took place on 28 January 1916, on a double bill with Leoncavallo’s Pagliacci. The first Spanish-language opera to be performed by that company, it received five performances that season—but not a single one since. When the orchestral Intermezzo between the first two of the opera’s three scenes proved too brief to accommodate the change of scenery, Granados composed, overnight, the second, more expansive version of this lushly romantic music that you will hear at this concert, in a transcription for solo cello and string orchestra. The opera played a role in Granados’s untimely death. American President Woodrow Wilson’s invitation to perform a piano recital at the White House caused Granados to postpone his return to Spain. The ship that was bearing him and his wife home sank after being struck by a German torpedo in the English Channel. This charming work dates from the period during which Mozart composed more symphonies than at any other time in his career. Between 1770 and 1773, he composed no fewer than 28 of them. None were published during his lifetime, despite their quality. This may have been the result of advice that his father Leopold gave him in 1778: “I have not given any of your symphonies to be copied,” he wrote, “because I knew in advance that when you were older and had more insight, you would be glad that no one had got hold of them, though at the time you composed them you were quite pleased with them. One gradually becomes more and more fastidious.” An unnecessarily harsh judgment of the sort of piece you will hear tonight! In July 1773, Wolfgang and Leopold travelled to Vienna from their home in Salzburg. Their goal was to secure a position for Wolfgang, the seventeen-year-old genius, at the court of Maria Theresa, the ruler of the Austro-Hungarian Empire. Despite an audience with the monarch, no such position materialized. The Mozarts returned to Salzburg in September. Mozart would work there in unhappy and under-appreciated circumstances for another eight years before abandoning Salzburg for the life of a freelance musician in Vienna. The 1773 visit to Vienna did have its positive side. Mozart had the opportunity to examine the latest compositions of the most celebrated composer of the day, Joseph Haydn, who later became a close and mutually inspiring friend. Mozart was also active as a composer, creating six string quartets, and incidental music for a play: Thamos, King of Egypt. He composed several symphonies during this period, both before and after the trip to Vienna. The numbers that were attached to them during the late nineteenth century do not accurately reflect the order of composition. He wrote the well-known No. 25 in G Minor, for example, after the journey. Its highly dramatic nature reflected the exposure to the music of Haydn and other progressive composers that he had encountered in Vienna. On the other hand, he created No. 27 in Salzburg shortly before the trip to Vienna. In it, he continued to follow the pattern of the three-movement Italian-style operatic overture which had served as his primary symphonic model up to that time. The first movement is based on a cheerful first theme and a gracious second. The second movement (in which some writers hear pre-echoes of Schubert) includes several individual features. The upper strings use mutes, and the lower ones play mostly pizzicato, while Mozart gave the flutes a more prominent role than in the first movement. Mozart scholar Neal Zaslaw calls the main melody “the kind of air sung beneath the balconies of young Mediterranean women in many an eighteenth-century opera.” The high-spirited final might almost be a waltz if the tempo weren’t so fast. Mozart bends the knee to earlier music by including passages in fugal style. Earthshine is sunlight that is reflected off the Earth onto the dark part of the Moon as seen in our night sky. Particularly when the Moon is in a crescent phase, it is possible to see both the crescent brightly illuminated by the Sun, and the rest of the Moon faintly illuminated by the Earth. In this way, earthshine is an impact that our Earth has on something beyond the Earth, while metaphorically, it is a reflection of ourselves that brings light into darkness. Earthshine is a single-movement work for string orchestra exploring light and shadow and the space in between. Known above all for the enchanting Concierto de Aranjuez for guitar and orchestra (perhaps the most-performed concerto of the twentieth century), Rodrigo also composed a large catalogue of other music. It includes additional concertos (for violin, piano, flute, cello, harp, two and four guitars), miscellaneous orchestral pieces, numerous solo guitar works, a ballet, a zarzuela (operetta), and many songs—nearly 200 works in all. Blind from the age of three, he began his musical education in Valencia, then moved to Paris for composition lessons with Paul Dukas. He returned to work in Madrid after the Spanish Civil War. While his reputation as a composer grew steadily, he was also active as an academic, a music critic and radio producer. Later, he toured the world, teaching, lecturing, and attending festivals devoted to his music. He received many honours during his nearly 98 years, including major awards in France, the United States, Spain and Belgium. The premiere took place in Madrid’s Palacio de la Música on 4 November 1949, with Cassadó as the soloist and Ataúlfo Argenta conducting the Orquesta Nacional de España. That performance and another that took place in Rome a year later drew strong audience approval. Feeling that the piece was too long, Cassadó made cuts without consulting Rodrigo. They were restored before the concerto was published. The first movement struts along in cheeky fashion, the soloist supported wittily by the orchestra. A lyrical theme introduced by the cello provides appealing contrast. A buildup in volume and energy paves the way for a solo cadenza, further development of the themes, and a wistful coda. The slow, dreamy second movement is based on an appealingly melancholy theme. Dance-like animation builds in the central section, only to cede to the return of the lovely opening subject. The recurring theme of the third movement offers a most attractive blend of elegance and humour. Rodrigo’s virtuosic demands upon the soloist reach their summit here as well.